Silk t-shirt & bag, car boot sale, £2 each - H&M coat, my mum's - Shoes, charity shop, £3 - Jeans, c/o Aubin & Wills. Evening all! I arrived back home early this morning after spending just under a week in Calcutta/Kolkata attending a young people's conference on behalf of the Victoria and Albert Museum. It was quite the culture shock, but it was an amazing opportunity and experience, so I'm really happy that I was chosen to take part - I'll be sharing some pictures with you all soon! For now I thought I'd share with you an outfit I wore just before I left, for a quick visit to my local charity shops with my mum. I wore my always favourite secondhand shoes, along with a silk t-shirt, car boot sale bag, my mum's coat and a lovely new pair of jeans. I felt rather elegant in this ensemble I must admit, for me nothing beats a classic all black outfit. Love, Jazzabelle. 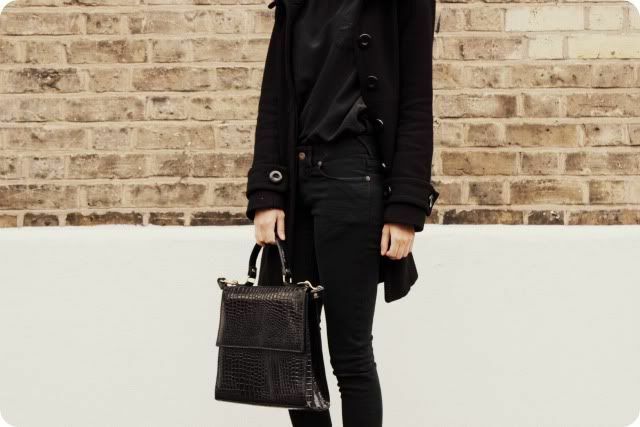 Nobody can pull all black off like you, seriously! You look amazing, I love your pictures on Facebook too! I can't wait to hear about India, hope you're feeling better. Black is the best colour. Even better worn top to toe. Look forward to seeing your pics from India. Lovely outfit and fabulous pictures! Lovely, lovely outfit, and you look absolutely beautiful. So elegant! I look forward to hearing about Calcutta! My go-to outfits are always all black. So of course I love this!! That silk t shirt is an amazing find!! Those jeans look like a good fit - are they worth the money? you do simple chic like nobody else! Ohh, what an exciting trip - I can't wait to hear more about it! <3 And I love this outfit; the bag is incredible! Sounds like an amazing trip!!!!! You look great aswell !!! That bag is just delicious, really need to get myself at some more boot sales. 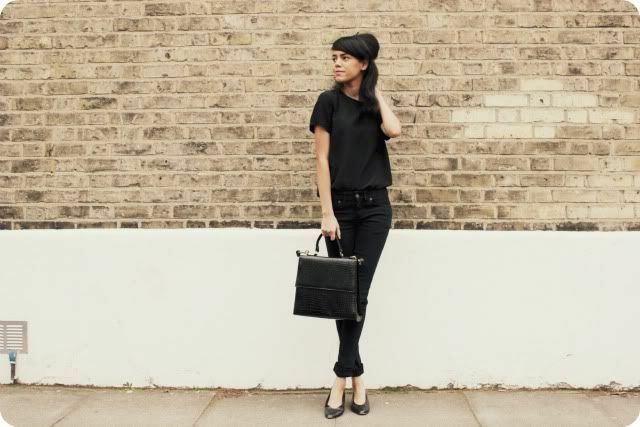 It really reminds me of the Aspinal of London business and laptop bag http://bagservant.co.uk/bag/15366 although I think I prefer yours! Great post. Love the coat. Beautiful bag. Love the photos. Loving the Bag and Coat. Cannot get over how beautiful your style is sweetie. I love more and more your style!